My father's E-mail account is rejecting all messages sent to it. He has tried turning off the spam settings on his account, but he is still not receiving messages. He is a real estate agent and this account is used for his business, so it is very important to get it back online as soon as possible. Google tried to deliver your message, but it was rejected by the server for the recipient domain gmail.com by gmail-smtp-in.l.google.com. [2607:f8b0:4001:c05::1b]. His address should be *****@******.***. Oh, sorry I didn't know about that. We checked on that one, but he is only using a small portion of the space and we emptied some extra E-mails to make more space, but that didn't help either. By the way, when I said this needs to be fixed soon, I meant today. I'm not counting the minutes, so you can relax a little if you want. he actually has 3 E-mail addresses that are supposed to send to each other: one at comcast, one at gmail and one that goes through ReMax Properties with the extension .wesellmore. Yes I have his computer and it is logged into the account gmail account, but it says it is 18% full. By the way, is it possible to shift this thread over to chat mode? well I tried it and nothing came through on his side when I reloaded the page. I usually don't get a message from mailer deamon saying it failed for hours after the sendout, so I don't have anything on my side either. Interestingly, I tried sending a message to comcast.net and that worked. I sent one from comcast, but nothing showing up on gmail. i just sent a test message, can you check your inbox nowdid you receive something? Doesn't look like it. I checked spam and the normal folder, but there is nothing new. In fact, the most recent message it has received is apr 28.
can you press the wrench icon at top-right, and select settings.and go to filters.are there any filters set? I disabled both and saved the changes. IMAP was already disabled, but POP said it had been on since 2012. I sent him a test message as well, but nothing has come up. It sent, but nothing is coming up in the inbox. If I logged out I couldn't get back in. I don't have his password. this may be a browser related problem. normally are you using chrome? Yes, he has been using it for years. So, switching to his would take the password. I am out of ideas. Let me opt out and open this question to other experts (email) If no expert opts in back we can continue. Hi - My name is***** and I will try to help you with your problem. This error message in the returned or bounced emails, 452-4.2.2 The email account that you tried to reach is over quota. means, to my level of understanding, that your *account*, not your email program but the stuff on the server out there on the Internet, is &#39;over quota&#39;, which means it has exceeded some limit.Most likely that limit is the number of stored emails. Have your father log into his email account, and look for some indication as to what % of allowed emails he has. If it is above 80 %, I would advise deleting a substantial number of worthless stored emails in the account. That helps in this sort of case, and it is a very common problem. I am signed into his account at the moment, so I can see what is going on. At the bottom it says that he is using 18% of his storage capacity, is there a different place I ought to look? Admittedly 18 % is not &#39;overuse&#39; in most definitions. Does his account have a lot of attachments on the emails, or attached files? perhaps that might account for it, if so. I think I read in google's documentation that the attachments are included in that figure. Also, he deleted about 250 E-mails the day before yesterday and the problem still presists. I think part of the problem may be that his company, ReMax Properties has given him a separate address which still seems to have the interface of gmail. So, he has a gmail account and the one that he uses has the extension: .wesellmore.net. I'm starting to wonder if the gmail account that is supposed to redirect to the wesellmore account is the one that is full. That sounds like a clue toward the solution.As for login... try logging in to that account via a web browser. If the account *is* full - of Spam no doubt - then it may not work, trying to log in to it via Outlook or similar program. Try Internet Explorer instead, log into it there, delete emails there. I managed to get into the gmail account, it was just taking a minute to reset the password. 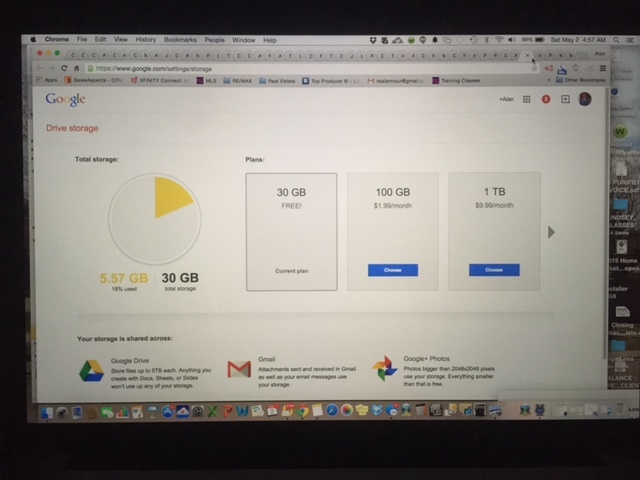 Gmail was indeed overfilled (by 1.5 GB) and I deleted about 25,000 messages from the promotions file which opened up enough space that it started receiving messages again! The trouble is the messages are still not showing up on the wesellmore account. Good so far.Try going back into the redirection or Forwarding settings in the appropriate account, and see if that helps. Neither I nor he are sure how he first set the account up. Could we use a way to forward the messages even if it isn't the way it used to be? Well, gmail is supposed to be forwarding to wesellmore. I'm not exactly sure what wesellmore is. In appearance it looks like a gmail account, just with the ReMax branding at the top, and the address is changed fromCustomerat gmail.com to alan.armour at wesellmore.net. 'We sell more' is a company slogan of ReMax, so it must in some way be provided by them. I hope you can excuse me, but I really cannot stay awake any longer, so if you want to leave an answer for me I will review it first thing tomorrow morning and if I have no further questions, give you your rating. If you need any other information I will make my best effort to find that as well. OK, we don&#39;t need to know what the wesellmore account is exactly, just only what its email address is. Then we forward the GMail account to the wesellmore account&#39;s email address. Setting a GMail account to forward to another email address is simple enough:- open the GMail account- click on the &#39;Gear&#39; icon at upper right.- click on Settings- select Forwarding And POP/IMAP- click on Add A Forwarding Address in the Forwarding section- enter the email address (for the wesellmore account)- Then you have to open the wesellmore account, and check for the verification email that the wesellmore account should have received. That will contain a link, which you click on to verify and approve the forwarding of email to that account.- go back to the GMail account, and click on Reload (the circle-arrow icon. )- on the same Forwarding And POP/IMAP page in Settings, check that Forwarding A Copy Of Incoming Mailis selected, and the right address is in the drop-down menu.- in the second drop-down menu, choose what you want GMail to do with the messages that came in, after Forwarding them. Either the Keep In The Inbox or the Archive options are possible, for instance.- click on Save Changes. If this answers your question adequately, please rate my Answer when you&#39;re online again, by all means... favorably, I hope, so I may be paid for the work I have done on your question. Thanks, ***** ***** luck. My gmail is not delivering messages to Yahoo, Hotmail, etc. I have received a very damaging email through a gmail account.